10. Rousseau 3509 9" x 12" x 1/4"
This has proven to be one of the most versatile tools I own. It is amazing how it adds to the capability of the Makita saw. This has been used for everything from construction to furniture. The Rousseau PortaMax 2700XL saw stand has been the perfect addition to my 10-inch Makita 2703XL table saw. Now I can ditch the non-folding bolt-on stand that came with the saw and hampered its portability. This stand also fits the popular Dewalt DW744, some Delta, Skil and Ryobi models as well as Hitachi, but if you own the Bosch, you'll need to get the model 2500 or 2775 saw stand instead. The Rousseau fence is a big improvement over the Makita's stock "fence O'frustration" that can easily make anyone attempting to use it with any accuracy, feel like the Rain Man. At 27-inches, the stand more than doubles my saws original rip capacity of 12-1/2 inches. I also plan to add the 2715XL table extension with the router plate, which will turn this stand into a workstation and increases my saws rip capacity to a whopping 49-inches. You can also get the table extension without the router plate if you don't need it. Adding the removable 2720 outfeed table will make this the ultimate portable package, for my needs. Setup/breakdown is a simple one-man procedure and if you work alone or move from job to job frequently, this folding saw stand is a savior. 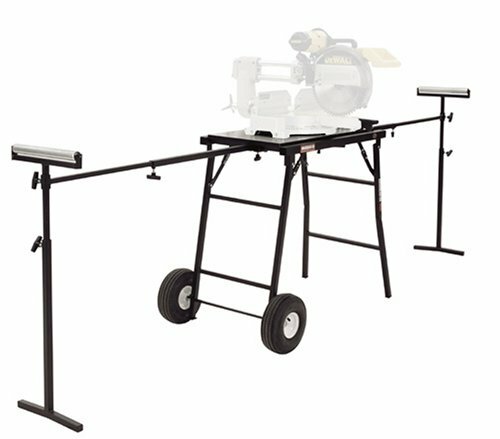 I feel that even when totaling up the costs of this stand with my Makita table saw, the outfeed table and table extension with router plate, I will have greater functionality and still will have spent less money than I would have for a similar setup with one of Dewalt or Delta's heavy contractor saws that require two people to lift and take up almost the whole bed of your truck. In addition, since several other manufactures saws will fit the stand, if my current saw happens to quit on me in the middle of a job, and the local tool supply house doesn't have the same model to replace it, or I want to go with a different brand, I can drop in any one of the other saws listed in Rousseau's compatibility chart and be back to on line quickly. Overall, I have no problem recommending this Rousseau stand. 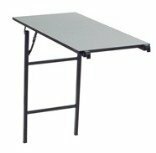 It is well made, reasonably priced and the available table extensions can give it excellent jobsite flexibility. Very nice. Best Portable Saw Stand on the Market! I bought my Rousseau 2700 saw stand nearly twenty years ago. I am a professional cabinet installer and use this product with my 8 1/4" Makita bench saw. It has been used five days a week, 50 weeks a year for nearly 20 years. It looks awful, there is virtually no paint left on it, the table board and the out feed table are full of knicks, dings, and oops cuts. In addition to use as a saw, it gets used as a workbench, utility horse, mitre saw stand, and lunch table. Through out all the years of job site use, and sometimes abuse, it is still very acurate and holds it's square as well as the day it was new! In my thirty six years in the cabinet trade I've had many tools come and go. None of them can even hold a candle to the quality and durability of this saw stand. This product deserves fifty stars! Thanks Rouseau, you are the best. 3.) you can add two extensions to the front and side for some extra money. 1.) its not truly portable cuz it doesn't fold up into a smaller size. Portable-Move it where you need it, when you need it. Adaptable-Attaches to any vacuum system. ... I contacted Rousseau about this, and they reassured me, that they are both the same stand, except for the 9" difference in the shelf-platform. 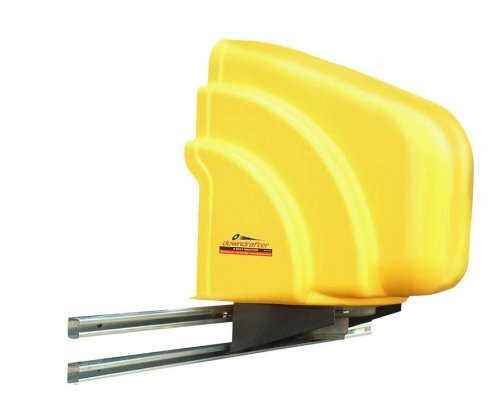 You could use the XL with a smaller saw, but you create a larger distance from your saws base, to the beginning of the extension wings. If you do have the XL with a 10" saw, you may choose to offset the installation to the left, bringing it to within 1/8" of the stop system. Or you could center it, then move the stop measuring system over to the right, to an eighth of an inch of your saws fence. So the XL can work with a smaller saw, although it is best to mate it up with the proper model, to shorten the overall distance from the left and right wings. I have to say, overall, once you set it up, and calibrate your measuring system, look forward to setting aside your tape measure, with the floppy tab on the end, and drawing a pencil line, that is difficult to decipher. Just set the hairline on your stop system, lay down your board, and cut it to the perfect length. Rousseau seems to go the extra mile in their engineering, and this stand is a good example of that. Hope this helps. I've used this stand for about two weeks now and absolutely love it. My primary gripe is with the assembly and the instructions. The instructions are cryptic at best and have itty bitty little xerox copies of pictures to reference. Very painful to try to decipher. Also, depending on your saw you may have to drill some extra holes for the fence to fit right and align with your miter saw fence (I had to do this with my Bosch). It took a lot of time for me to assemble this and get it working (about four hours for me) but it works fine. One of the components was bent in shipping and I called Rousseau and they sent me a replacement without any charge. They were very nice on the phone. Now the good news. This is an excellent and versatile tool. It is very helpful for smaller shops as it is very easy to move around. The assembly is very sturdy and probably will last forever. The measuring fence (shown on the left side of the unit on the photo) is very accurate and reproducible. This tool really addsa lot of flexibility to the use of a miter saw. If it weren't for the lousy instructions I would easily give this 5 stars. I bought this particular model to mate with my Bosch sliding miter saw. A bit tight on the table-top depth side, but if you follow the instructions your saw will fit. Assembly is fast and easy..again follow the instructions...don't tighten bolts until you are told to do so! Take your time when setting up the stop assembly...yes follow the instructions again...and you'll have unparalleled accuracy. (Would have liked for Rousseau to have included another tape for the front of the stop assembly fence...but tapes are available at the hardware store.) All in all...it costs a couple of dollars more (but so does my Cadillac) than the bargain barn variety and for a couple of dollars more...you have quality and year's of service. At first I was disappointed when opening the box to find that the SS2875XL was black instead of the blue gray as shown in the picture. I like the blue to brighten up the shop. Anyhow, I quickly got over it when I discovered just how substantially this stand is made. Much thicker metal than the stands you see at major retailers. Assembly is a breeze. It comes with both sides pre-assembled. So the sides with the wings are already attached and ready to go. All you have to do is install the top and bottom trays, the measuring-stop system, and wheels. The trays have two bolts and nuts in each corner. After hand tightening, you use a tape measure, and cross measure to make sure it is square. Then tighten it up. The cross brace keeps it true. Then you turn it over and install the wheels, using a block of wood and a hammer. They are meant to go in an never come out, unless you insist they do. The locking mechanism on the wheels is very accurate. They lock and unlock easily with a foot lever, and it holds the unit true-no moving. This thing is a monster. When they call it the XL model, that definitely stands for EXTRA LARGE. I love it. When it folds down, it conveniently takes up a lot less space, but when fully extended by simply lifting up the wings on each side, it has a 9 foot width. The stop system (something they call the stop system, which is actually the well made aluminum track) has two stops and two measuring tapes, one for long stock, and one for short, and they are super heavy duty. No bending a measurement. It has the clear plastic with a hairline measuring line. Everything on this unit is adjustable, so you can set it up accurately, and still tweak it in the future. That is thanks to the quad T-mounting slots under the stop system. Choose which one lines up with the fence on your saw, then for extra adjustment, they provide slotted out grooves, so you can slide the bolts front or back to perfectly align the fence-guide system to your saw. Additionally the wings have a slide adjustment on them so you can tweak them to create a perfectly flat and level stand alongs it's entire 9 foot length. The upper tray that holds your saw, has the same option, multiple mounting holes, and slotting to zero in the final setting, thereby giving you a perfectly flat mating to your saws base. One thing that is important. I am using a Makita LS1212 on it, and that requires an optional bracket. If your saw is larger than most, check with the listing in Amazon.com's Tool Crib catalogue for the part. It is available via 800 number and phone order with Visa card etc. Even though the table on this unit is large, the Mikita base extends out the back of it. So the optional kit is neccessary. The kit is not available online. The SS2875XL is not designed for portable use. It does have an optional larger wheel kit, but this thing is 87 pounds. Add to that my 48.5 pound saw, and you can see that hauling around a 120 pound unit, is not what you want to carry up and down the stairs. What this is, is a great unit for the shop. That is what Rousseau calls it in their catalogue that you will get with your stand. They call it a "Shop Style" stand. They have the Porta Max, and the quick fold stand if you want lighter weight, and large wheels. If I had to be portable, I think their portable unit like model 2950 is better made than the lightweight units available on the market. They give you one wing that is the same as the SS2875XL, and the other wing is like the single roller that you see on the Dewalt stands on both sides. On the left side wing, you can get the optional stop system-measuring, which is very accurate, probably the most accurate of the portables. It also gives you the advantage of a left side rack that you can place all different size boards on without having to readjust a single roller every time. It is a complete wing like the shop stand. 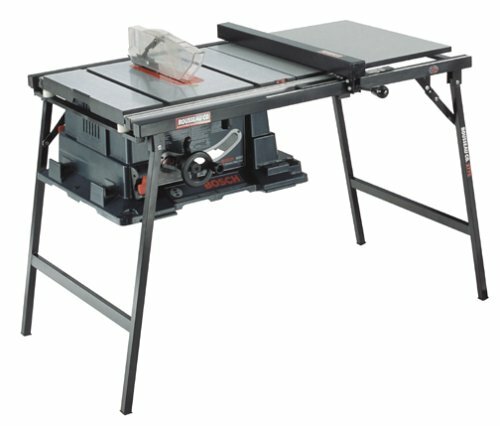 Ok, first let me say that I love Rousseau products and have purchased the PM2700XL 3 piece table saw system to support my new Makita 2703. Everything is as it should be, solid, refined and painstakingly well designed. This miter stand is next on my wish list. Moisten the sidewall bead area with some water and make sure both the tire and rim are free of dirt. Take a piece of standard clothesline and tie a loop in one end and pass the other end through it to fashion a large slip-knot. If you're not handy with rope use a ratchet strap, or an old leather belt with a loop buckle. Wrap it around the centerline of the tire's tread. Cinch the rope (ratchet the strap, tighten the belt) back tightly to compress the treads in towards the center of the tire evenly. You may need someone to hold the tire for you to keep it from turning, I just used my knee. This will force the sidewalls of the tire outward and into contact with the rim. At this point, just about anything that blows air will inflate and reseat your tires. I used a Campbell-Hausfeld battery powered compressor and it did just fine. Using this technique a bicycle hand pump would probably do equally well. Good luck and check your tire pressure frequently. I called Rousseau's toll free number and they are sending me new wheels free of charge. Their customer service was friendly, prompt, and intelligent... perfect. This brings the stand up to 4 or 4.5 stars in my opinion... to make it up to 5 they would need to make it easier to work with while folded up -- as another reviewer said, the attachments for the T-stands stick out a lot and there's no easy place to stow the T's themselves. But in actual use I love this stand and it's always worth the setup time to use it rather than going back to repetitive measured cutoffs with a skilsaw. Great with extension table & stops... but, tire problems. I really love my HD2950 and it is worth every cent. I added the extension wing with cutoff stops and integral measuring tape and I get perfect repetetive cutoffs every time. The extension is very solid. I've had no problem putting a 16 foot 4x8 on this table with its extension wing and adjusting it for a perfect compound miter cut. The partial downfall is the tires. I agree with the reviewer who said that despite their large size and bounciness they still can get hung up on rolling over, for instance, a walnut or garden hose. Worst of all, my tires came unseated after some broad temperature changes (i must not have aired them up often enough) and these particular model tires are impossible to remount with a bicycle pump. In fact I just took them to a couple of car-tire stores and they were unable to get them reseated with 200psi compressors. Apparently there is only the main bead on the tire rim, and no secondary bead to help make the preliminary seal while the pressure builds. It's near impossible to keep the rubber pre-seated on both sides while also filling them. There's probably a simple solution like "do it underwater" but i haven't found it yet. I've reseated dozens of wheelbarrow tubeless tires before but this problem appears to be different. But I love the stand. I just might replace my tires with an equivalent size solid tire. First and foremost: this is a great stand. I have been futzing around with homemade mitre saw stands for years without much satisfaction. This saw stand has made a significant productivity improvement for myself and my employees. However, there are two drawbacks I wish Rousseau would address: #1 - There is no place to store the feed roller supports when the stand is folded. I stash them between the table and the folded legs which works OK until you need to lay the stand down in the truck bed and then the supports fall out. Other than that, this is a great tool. #2 - There is no intermediate (roller) support so you have to constantly adjust the feed rollers in and out as you cut moulding down and then get a new piece. If there was an intermediate support, then you could set it up so that both a long and short piece of stock could be supported without adjustment. Mostly Good but . . . I know it's kind of expensive, but it'sreally worth it. I was having trouble moving my Bosch "portable" table saw even though I'm a burly 6'5, 250 pound guy until I got it. It's a real sturdy stand that let's me move the saw easily - down 50 yards of gravel driveway from my shop to my house, then up six steps to the deck without hassle. I also wheel the saw to make the best use of shop space. I move it inside my shop as needed to cut large boards, or into a corner for storage. I generally don't fold the saw stand up unless I'm loadining it into my pickup. Simple to assemble, set up and use. I have a Makita, and Rousseau said I had to make a plywood base. It works great. Better than what comes with the saw. It is built for the beasts out there, so it is a bit big to go in and out of my trailer. No more saw off, move stand, saw on. Just push the button and(be careful..pinch hazard! )fold up the wheels. I got the MM2500 for my Porter Cable table saw, since while it is possible to lift and move this saw, why bother. Although the stand is not drilled for the PC you can get away without drilling if you angle the bolts slightly or someone less lazy could slot the existing holes with a file. It's a great improvement, and makes a really good saw stand, just don't try to pull the unit up steps using the handle alone (grab the saw as well), the handle tends to pull out past the spring loaded stop even with the locking screw thumb tight , leaving the unit to gracefully summersault backwards down the steps. That aside a great unit, well worth the price. I am a remodeling contractor and my work consists of kitchen and bath remodeling, some cabinet making and a lot of misc. construction projects. 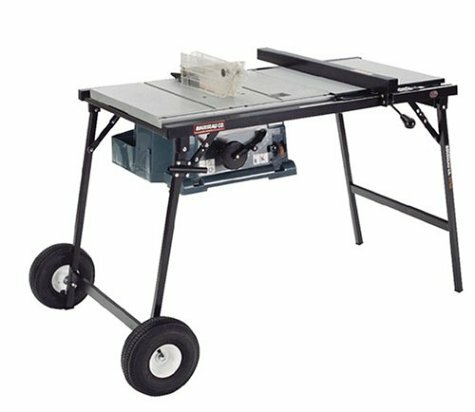 For the last 20 years, I have lugged a Makita table saw around in my truck and for the most part, cut material with the saw placed on the floor or ground. 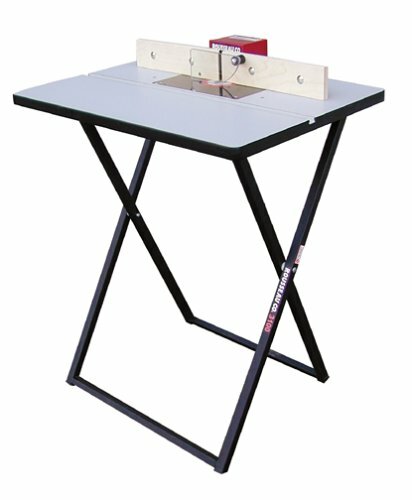 Now that I'm older and don't bend over as well as I used to, I've searched for a good saw stand that is portable and found, in my opinion, the perfect one. I have owned the Rousseau 2950 for my Dewalt DW708 miter saw for about 2 years now. At first I thought I made a mistake because of the size of the unit and the limited space in my van. I'm here to tell you, besides the saw, the stand was the best purchase I made in years. This lead me back to the Rousseau line of products for my consideration of a table saw stand for my Makita 2708 table saw. Originally I ordered the Rousseau 2700XL kit. The more investigating I did the more I started to question my decision to purchase the 3-piece set. Where or how will I store it in my van? Taking the saw out and storing it just meant more space being swallowed up. I was having buyer's remorse only days after placing the order. I called Rousseau and questioned them on the 2750 Portamak. Another problem I was dealing with was the replacement of my old 2708. I wasn't sure what I wanted to buy to replace it. I needed / wanted a 10" saw and wasn't sure if Makita was going to be my choice. Considering all the pros and cons, Makita makes a workhorse saw and the pros for me outweighed the cons. Another plus is that my 2708 can still retain a spot in my collection of tools till I'm ready to spend another $300.00 for a new portable saw. Rousseau told me they sell many of the 2750 Portamak tables. I was surprised because I never see any reviews on it. The fella went on to explain it's portability and that the saw bolts to the stand permanently. My problem solved! I quickly went back to Amazon and cancelled my order for the 2700XL kit. Purchasing the 2750 with the out feed table, router table and extension wing cost a few more bucks than buying the 2700XLK however this wheeled stand is well worth the extra money. I have total portability on the jobsite to boot! I just fold up my stand with saw attached and roll it up and down stairs to and from my truck! My back is happy and I am happy! Setup is simple. There are hex screws that adjust for table alignment and fence rail alignment. The fence slides freely across the extension and router table joints very nicely. With the router table and standard extensions installed I have about 8' of table width. Full sheets of plywood are a breeze to cut AND I'm standing up! I only wish I bought this table sooner. I want to express how customer friendly the Rousseau guys are. They are tops in my book. Any questions I had were answered on the spot. After receiving my table I had noticed the edge of the table was damaged in shipping. No problem, they sent me a replacement! I questioned a design oversight on their part and they made the part and shipped it to me. Rousseau gets an A++++++ . If this stand holds up to all the bouncing banging and rolling around that my 2950 takes, this is going to be one heck of a stand. Keep in mind that this is a portable stand made for a portable saw. This setup will not match the ability or sturdiness of a floor mounted shop saw, BUT is comes darn close for what I need it for. The ability to use my router for quick dadoing using the same dead on saw fence is an added plus. Mounting a router fence to the table is also possible. The 2750 stand accepts all the options offered in the 2700XL version with wheeled portability. The only saws that fit the 2750 are Makita2702, 2703 and the 2708. If you have or are going to purchase a Makita saw, you need this stand!! If you have another brand saw, you will need to get the 2700XL and lug it around, but setup and ability to use your saw like a stationary saw is worth the effort! Thanks again Rousseau for the "2750 Portamak Saw Stand"! It's Wheels make portable a new word! Not a lot to say about this product. It is made of very solid material and is very easy to install. Getting the router centered on the plate is the hardest part of the install and this was made easy by the circle marks on the bottom of the plate. All you have to do is find the set of circles that is the same size as your router base and clamp or tape it down. I would have given this product a 5, but the center rings are a little difficult to remove. I like to use the plate just as much out of the table as in so i am ordering another to install on my second router. I had some trouble getting my router centered in the plate. However, I found a way to overcome this: If it is a Porter Cable, collapse the router base all the way down until the base plate engages the collet nut. The nut will serve to center itself within the inner base plate removable rings. Sandwich the OEM router base plate between the router base and the new base plate. Use double sided tape to hold it in place. Now the OEM plate and the Rosseau plate should be stuck together. Set the unit up in a drill press and the OEM plate will have the holes located fairly close. Good luck! Bosch 1613 and 1619 routers (and probably others) have clearance holes for mounting to a Bosch table. You can drill the Rousseau insert plate using the circle patterns on the underside at those locations to get reasonably close to center, mount the router with 10-24 machine screws and nylok nuts, and center it using a Porter-Cable 1/4 inch template insert and a 1/4 inch drill rod chucked in the router. Snug up the mounting screws and you're done. The plate fits very well, although it is JUST large enough for the 1619 without rotating it on the insert. I did use the Rousseau template to cut the hole and rabbet the edge; you can make your own using the instructions with the insert, but for $14-15 it didn't seem worth the time. It's OK but its not flat. Its actually pretty wavy. Received mine about 2 weeks ago and setting up a table for it. The surface has waves in it about 0.01 - 0.02 in depth. I was hoping for better. I may chuck it and start over. I wanted to add to my other review. 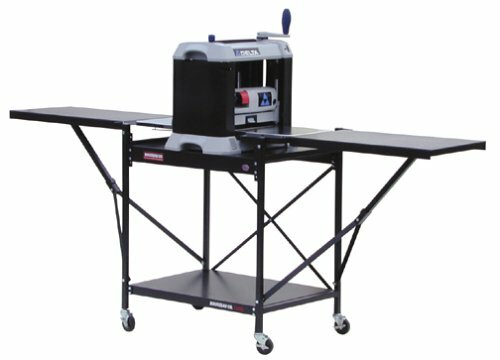 I must admit, the installation tip that I am about to discuss, I discovered by from installing the Bench Dog RT-250 router extension table. It is the way Bench Dog does their installation. The great idea is to use melamine screws, which have flat ends, and coarse threads to make an adjustable platform for the Rousseau plate to sit on. Ok, let me ramble. The problem is trying to rout out the opening, at precisely the proper depth, so the plate is perfectly flush with the top. A little too deep and you have a valley. A little proud, and you have a ridge to run into, and run the risk of your workpiece coming to a halt. So what to do? Rout out a 1/16" or 1/8" deeper than is necessary. Then drill holes a little smaller than the melamine screw size all around the outside lip. Since melamine screws are not tapered, the threads are the same size for the full length of the shaft. You can look up melamine screws here at Amazon with a search. They refer you to McFeeleys, which is a great business, with instant service, and a full array of screws and fasteners. Much more variety than the usual home centers. They have a box of 50 available. Ok so what is the big deal about using the melamine screws? This is it, by using the screws with the flat tips, screwed in from underneath, all around the circumference, you wind up with a fine adjust system for getting the Rousseau plate, perfectly level with the table top. Combining that with the four countersunk holes in each of the corners for securing the top, you get an incredibly adjustable platform for the Rousseau top. I used 14 melamine screws, equally balanced around the circumference. It enabled me to fine adjust the plate so well, that I was able to completely eliminate the ever so slight crown in the plate. Although I did attach it to a wide base plunge router, which I am sure contributed to the leveling. Since the adjusting screws are now the contact point for the base, you are now given a lot more freedom in routing the opening. For one, you don't have to rout up to the edge all the way around. You can rout to just one depth, and for example create 45 degree angle corner shelves under the plate, thereby creating greater overall stability of the greater table. This melamine screw installation is not exclusive to new installations, it can be easily done with an already installed plate. That way if you are dealing with a small dip on any edge, it can be easily corrected. Doubles the value and usefulness of your portable saw! I bought this table extension and fence for my Makita 10" portable table saw. The Makita came with a terrible fence that was almost always off-center and inaccurate. Even worse, the table was so small, you could only make cuts up to 12" wide. This table extension makes the saw able to rip full size sheet goods (the long way) and the fence makes the Makita a decently accurate saw to work with. So far I've used this combination for making speaker cabinets and homebrew arcade controls cabinets and it has exceeded my expectations. Rousseau has built a very high quality product. Portamax JR PM2600D, You Bet! Easy to install and easy to adjust. 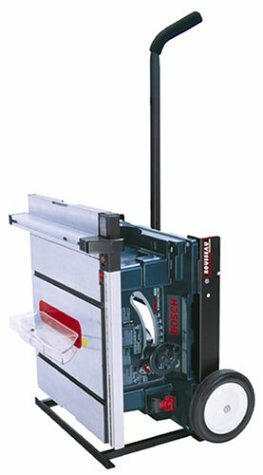 Although not noted in the writeup, the Portamax JR PM2600D is a direct bolt up for the Makita 2703 XL table saw. This makes this saw 1) accurate and #2)enable a 24" rip. This allows the accuracy of the rousseau table, but also allows you to use the stand that comes with the Makita 2703 XL saw. I would recommend this unit to anyone. 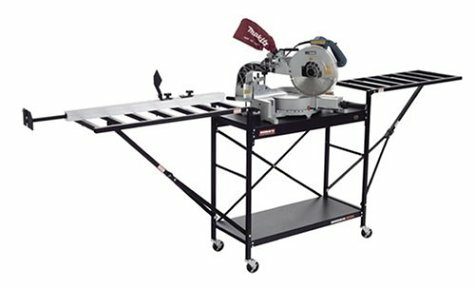 Adding the PortaMax Jr to your 8-1/4" or 10" Bench-top table saw gives you an accurate saw with a precise rip fence, equal to many higher priced Table Saws. Allow ripping a full 4X8 sheet of plywood lengthwise. This accesory is easy to install and Rousseau provides prompt replies to any questions that arise during installation. Table fits Delta, Makita and most other portable contractor's saws and allows you to make precise cuts using the strong, secure fence. I have used this accessory with my Delta 8-1/4" saw for cabinet making, and general woodworking. · Reusable design builds profit by eliminating the use of expensive wood and reducing labor costs. This looked like the best stand for my Makita ls1013. First box came with more than have the pieces damaged! How can that happen? The second unit came with mimimal damage, not enough to worry about but not perfect. Problems: 1)one of the tabs that holds bolts for the table was off by about 1/4 inch compared to the others. Didn't affect anything but where's the QC? 2)The instructions made no mention of the diagonal support struts or the difference in bolt size to hold them. not hard to figure out - service center said I must have accidently gotten a old manual - funny because my first damaged unit had the same old instructions. 3) instructions say to measure height of the saw platform and then mount the stand table this far down from the wings. 2 problems with this, first there is no one place on the wings that is a reference point, you need to lay a long straight edge along the wing to get the average. However the wings have some adjustment too so there is no real reference point. With a lot of trial and error I managed to get it very close and proceeded to mount the saw to the table. First had to mount the extra bracket for the makita (no real good instruction for getting this even with the table itself - ended up clamping two straight edges to the table and then clamping the bracket to the straight edges). Second, Got the saw mounted and tightened down and went back to check the saw table to the wings and realized I was about 1/16 to low!!! Turns out that there are rubber feet on the bottom of the saw that got compressed by the bolts, accounting for the difference. Already had the saw mounted to the table but needed to raise it. Figured out the best way was to turn some of my clamps into spreaders to jack up the table after loosening the bolts. This worked pretty well but still had to mess around with the wings ( the wing adjustment changes the angle, not really the height), Called service and told them about this and my "new and improved way" to adjust the table height and he said that's the way everybody at the company does it!!! and he didn't know why that method wasn't in the instructions. They had never considered the problem of the compression of the feet 4) now on to the tape measure. they give you two little allen wrench looking wires that are supposed to hold the edge of the tape off the rail so the exposed glue doesn't stick to the metal before you're ready. I couldn't get this to work, not enough space under the rule to accept the spacer. Service said that they knew that didn't work and everyone just ignored this part of the instructions. If you were really careful you could slide the tape in and it would stick until you were ready. This did work. I could not believe that the real way you put this thing together was so different than the instructions and that the service guy was willing to admit it. Makes you wonder what is going on that they won't admit to. Finally got it up and running and it seems like a decent unit, fence is nice and accurate and the foot print is small when folded down. still need to figure out a dust collection shroud. Don't waste your money on cheaper stands! I bought the Delta Universal Miter Saw Stand first. I thought I could save $100. Boy, was I sorry. It was too big, too complex and too narrow for my PC saw. I gave it away and bought the Rousseau XL model. It's sturdy, easy to store and move and the wings with the fence system is ideal. Don't waste your money like I did. Go for the gold! 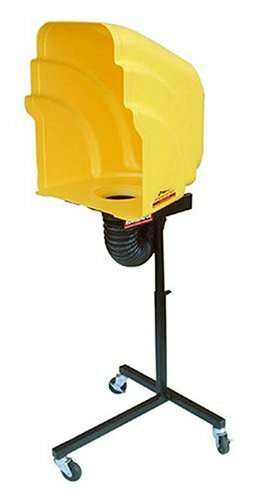 This is a sturdy roll-around stand great for use in a crowded shop or garage. When not in use it has a small footprint and can be parked out of the way. When you need it, there's no complicated set-up. The wings pop up easily and you're ready to go. I'm using it with a Makita LS1013 which is quite a large sliding compund saw. There's a long L-shaped extrusion available for [money] that bolts to the back of the saw stand to increase the table depth by 2". I bought this stand for my Hitachi C10FSK saw. I've been using it for a few weeks on a cabinet building project and love it. What a back saver! I wish I'd purchased this years ago when I first bought the saw. It really speeds the set-up and tear down process in a small shop where mulitple tools share a small space. Absolutely love the dual folding wing functionality and design. So easy and accurate to use, assuming care is taken in the initial assembly of the stand (in particular the squaring of the stand with your saw and the application of the measuring tape). It's such a pleasure to cut stock without having to pencil mark cut points and align the mark with the saw blade. The flip down stock stops take care of this. These stock stops are very nice to work with and reading the measuring scale accurately is simple with the clean markings and the thin but clear hatch mark. I have to say that with one exception, everything works smoother than expected. Even the wheels work great and can ride over 1/2" high offset from crack and settling in my concrete floor with no problem. The only thing I see needing improvement is the attachment weld tab sizes for the two rear cross bars that help to square and stiffen the stand. There was a slight interference between the x-bar and the weld bead on my stand. This caused no problem other than a slight deformation of the bar when the screw was tightened. Nothing that affects the functionality of the stand. It's a well built, strong high quality product with superior fit and finish. Enjoy one for yourself! This fence adjusts easily, mounts and dismounts easily and quickly, connects to the dust collector conveniently, and in general works as expected. The only thing I wish were different is that the baltic birch face is not protected, as another reviewer commented. My solution was to cover it with UHMW plastic and double-sided tape. Laminate would work also, but the UHMW solution is quick, inexpensive, durable and easily replaceable. This is a fine piece of equipment that will outlive you. The bit is enclosed in a box that can easily be attached to a vacuum. Drill 2 holes to attach it to any existing router table(I mean uh,.. any existing router table that you are able and/or willing to drill holes in). All of the parts and hardware are high quality, heavy duty and accommodate large fingers and hands. The voidless 13 ply fences are easily adjustable. I bought mine years ago, so my information might be dated, but the only thing I can think of that would make this a better tool out of the box is plastic laminate on the face of the fences. I did this myself long before the first job I used it for was completed. It just seems natural to me that Rousseau would protect that sweet plywood and at the same time give this tool a look and feel that is similar to the rest of their product line. great for its features and fold-down capability. I bought the router extension as an add-on to the outstanding porta-max series of table saw stands. I must say that I have found it to be mainly useless. 1. This router extension slides into the portamax rails and is leveled to the portamax table surface using set screws. As soon as you apply a load to the router extension, the set screws dent the portamax rails. This makes levelling difficult and of course causes unsightly damage to the portamax. 2. The otherwise excellent portamax fence is useless as a router fence. The vibration and pulling motion created when routing with the extension table cause the fence to slide no matter how hard I was able to crank down the friction cam. 3. The thickness (or should I say thinness) of the particle board top and the choice of mounting points makes clamping an alternate fence impossible. Applying appropriate clamping force causes large bowing and flexing of the laminate top. The result is that once you discover that the portamax fence can't be used, you discover you can't clamp a straight board as a fence either. 4. The choice of the pop-out ring sizes in the plastic insert are such that the Dewalt DW-621 cannot be bolted to the insert and must be bolted to an intermediate plate which is then bolted to the insert. This is mainly Dewalt's fault since the DW-621 base is famously small and narrow. The bottom line is that for $100 you do not get much. I only got the plastic insert which I built my own table around. Anyone looking to add this to their portamax should think twice. Save yourself the hassle and just buy the plastic insert. it's a nice extension table and it's pretty easy to attach. i really like the high pressure laminate and the router plate. he he,.. the answer is no. I do not work for Rousseau. Like most home improvements contractors, I place a high value on tools that bring 'shop' performance to jobsites without taking up valuable space in my vehicle and/or several heavy trips to load and unload. This router table does that and has replaced other router tables because it is durable, accurate, more versatile and takes up a fraction of the space. 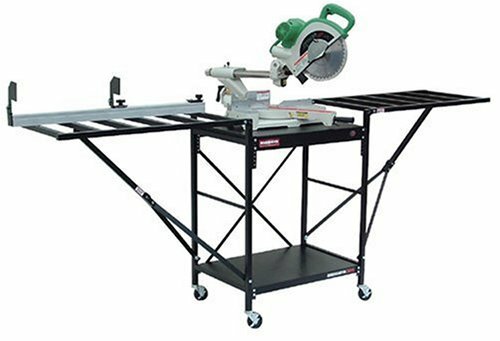 Like Rousseau's stable and accurate table saw mounting system, the extension table setup and adjustment, once done, rarely needs adjustment through repeated setups and breakdowns. You slide it into the table saw stand and you're ready to set up bits and/or fences. While the router table is a great extension to the table saw stand, I use it just as often by itself by just spanning it across horses or a garbage pail(most sawdust goes straight to where it belongs. Though you could rig a shop-vac without too much thought if you need better dust removal). While Rousseau's table saw fence can be used in this configuration for some applications and as a stable and accurate stage for jigs, their router table fence is another fine tool that deserves very serious consideration too. Additional removable base plates are readily available(or can be easily made in the field). This allows you to mount a variety of tools to different base plates and swap them rapidly. Several years ago, when I first bought the table saw stand, router/extension table and router fence system, I had doubts about its durability,.. and I'm beginning to wonder how many more times it will pay for itself and how many more years of abuse it will take for me to finally be able to claim I was right all along.